The Chipper Clipper: Get a free t-shirt from Aeropostale and Seventeen! 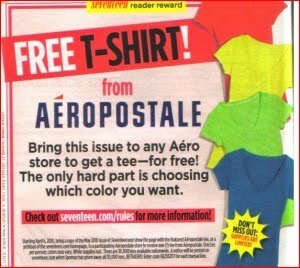 Get a free t-shirt from Aeropostale and Seventeen! Aeropostale is giving away a free t-shirt when you bring in the cover of the May issue of Seventeen or a print out of Seventeen’s homepage. You must be between 13-29 years old.